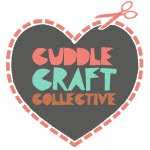 Have you come across one of my sewing patterns and then thought it was perfect for you but then realised that a finished 12" doll or softie was too small or even too fiddly for your skill level? Well fret no more, I'm going to show you how to enlarge (or decrease) your PDF toy sewing pattern to create a toy any size you wish. Step 1 ~ choose only the pages which contains your pattern templates otherwise you'll print the whole pdf at the enlarged size. The pages will now print the templates over a few pages so you have to have some sticky tape ready to join the pieces together. This option is a quick way for you to enlarge the pattern at home, however it does use quite a lot of paper so I suggest keeping the pieces or even using them to create cardboard templates if you intend to reuse them. 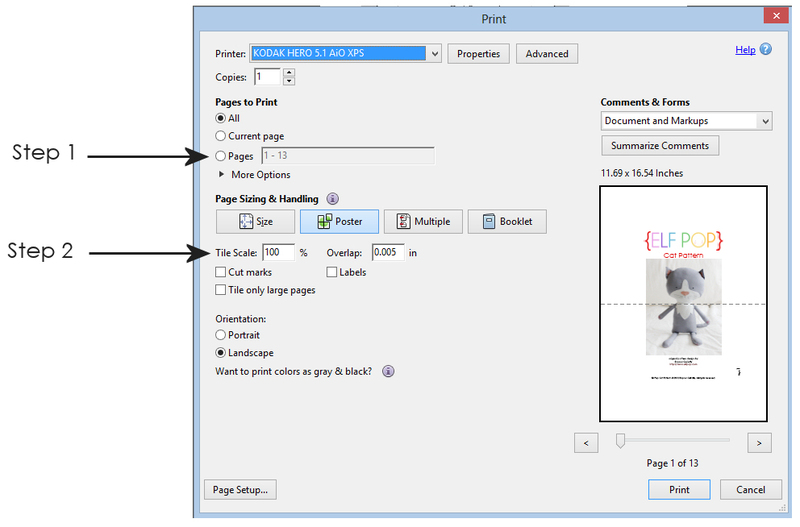 If you have already printed your pattern then you can use a photocopier to enlarge the template pages. Buttons will vary but most photocopiers have a zoom button which you can use to set your percentage increase. Most photocopiers can increase up to around 300%, so it may be a bit pricey if your looking for a huge pattern. If the photocopier you use only prints on A4 then you might need to tape together some pieces. To avoid taping or if you need some help you can also take the pattern along to a copy shop and have them do it for you for a fee. An at-home alternate to using a photocopier is to scan your printed pattern and resize. All scanners will vary so have a read of your instruction manual if you're unsure of how to do this. You'll need to find out how to increase (or decrease) the size percentage . The default will usually be set at 100% so any size under 100% will reduce the pattern and any size over 100% will enlarge the pattern. There is a site Rapid Resizer which allows you to resize a pattern to your desired size straight from your computer or scanned image. I haven't tried this site myself, and you need to sign up as a member but it does offer a two week free trial, and then a yearly subscription fee after. Another method would be to resize the pattern by drawing. This can be easily done with the help of an overhead projector to increase and trace the projected template or using grid paper to extend each line of the template. I would only recommend this method as a last resort as it's quite time consuming and not always accurate. 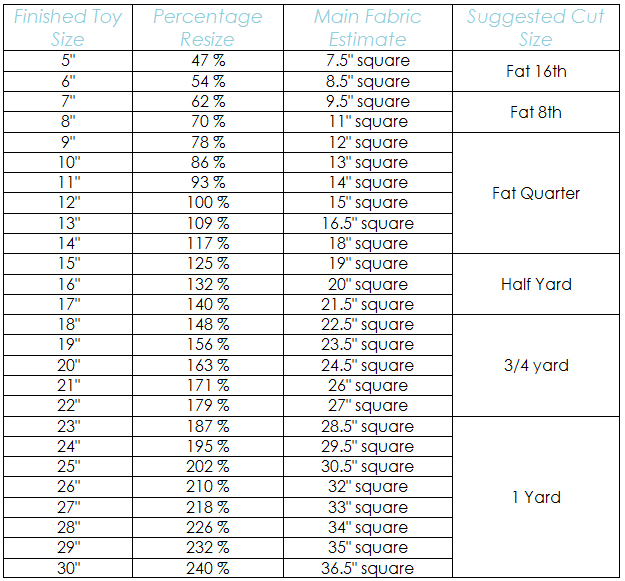 This table can be used as a quick reference to calculate your percentage resize and approximate yardage requirements for your resized softie. If the pattern is printed at straight from the PDF with no adjustments (100%) it will measure approx. 12" when finished. Please note that all these sizes are estimated and will very depending on which fabric material you use and how full you stuff the finished toy. The fabric estimate is based on the assumption the pattern you are enlarging uses one main fabric, however if you use different fabrics this will be an over estimation. Remember to adjust the sizes need for any appliqué detail which would not be included in the fabric estimate above. If you have the perfect leftover fabric to use but for your toy or your bolt is smaller or larger than 44" then you will need to work out if you have enough. To accurately calculate how much fabric is needed for your resized toy you will need a measuring tape to measure how much fabric is needed for one piece (include the seam allowance) multiplied by of repeats required. For example if you have a leg piece which needs 3" wide and 6" long then you will need fabric 12" wide and 6" long to cover make two legs (2 pieces plus 2 reverse = 4 legs total). Repeat this for every shape required and add the total length and width together to work out how much of how much fabric is needed. I suggest you add or purchase a few inches more than required to allow for any mistakes, pattern alignment or fussy cutting.